As I wrote in the previous few posts, on 30th April hubby and I visited Kinkakuji, Ginkakuji, and Kiyomizudera temples in Kyoto. 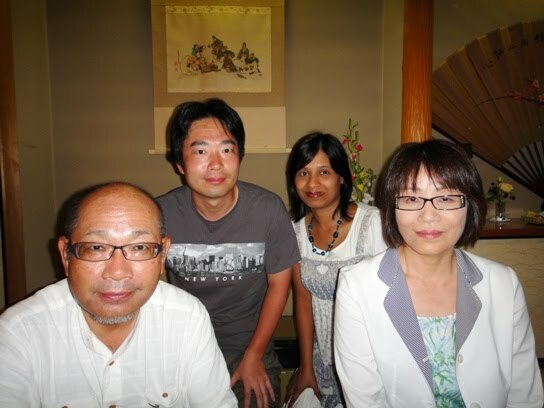 On 1st May we continued our visits to temples and shrines. In the morning, we first visited Higashi Honganji Temple about which I will write in this post. Higashi Honganji Temple is the more popular name of Shinshu Honbyo. 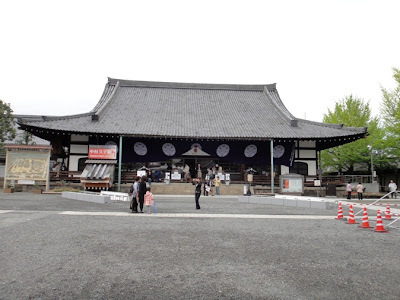 It is the main temple of Shinshu Otaniha branch of Jodo Shinshu Buddhism whose founder was monk Shinran. After the death of Shinran in 1262, a mausoleum named Otani Sobyo was built at Otani in Kyoto, in which a figure of Shinran was enshrined. 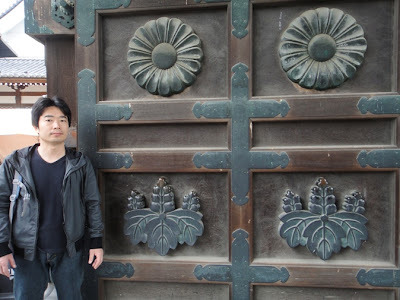 The mausoleum was built in cooperation with Shinran's daughter Kakushinni. 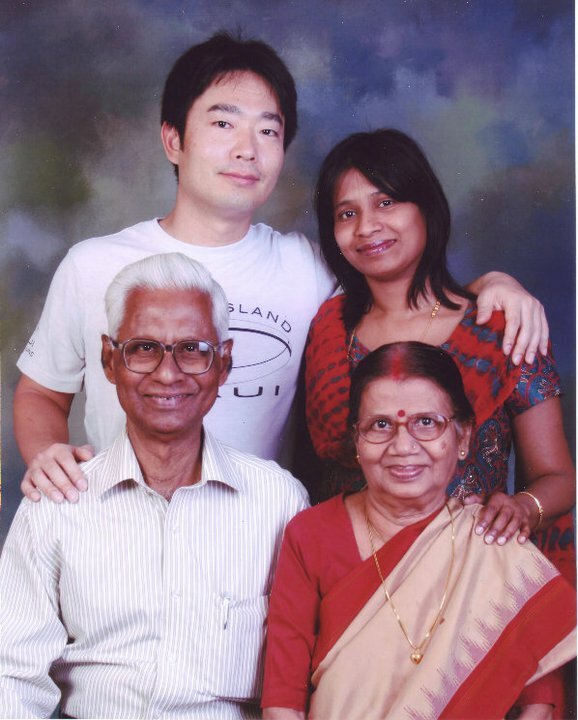 The position of caretaker of the mausoleum was inherited from her by her first son Kakue, followed by her grandson Kakunyo. Kakunyo changed the name of the mausoleum to Honganji, which was then officially recognized as a temple. Later the temple became affiliated with Tendai sect temple named Shorenin and started following the traits of the sect. 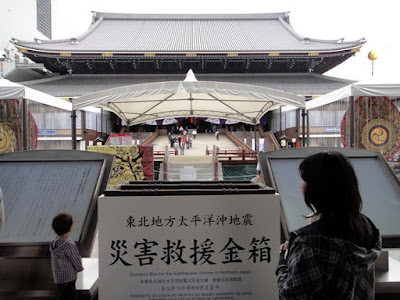 In 1457 Rennyo became the 8th successor who reformed Honganji Temple by abolishing Tendai sect services and established the format of chanting hymns composed by Shinran. However, Tendai monks of Mt. Hiei felt threatened and destroyed Honganji. 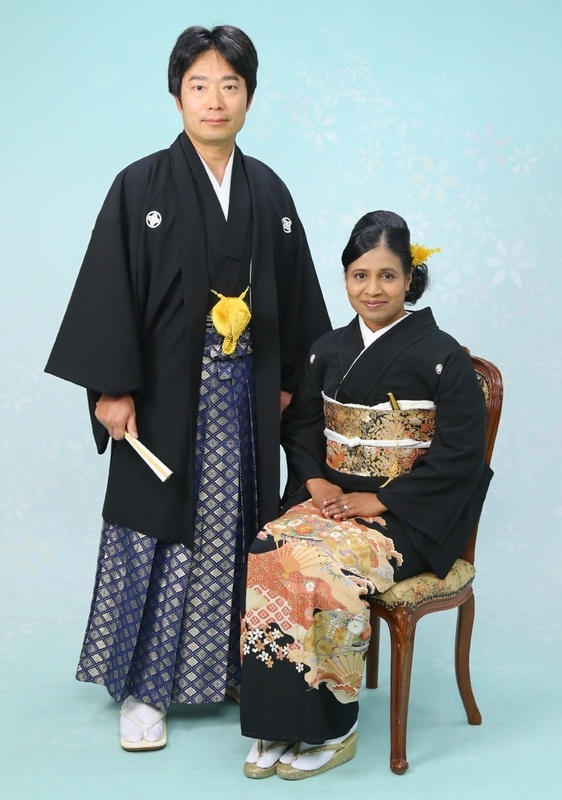 Rennyo escaped to Omi province, and continued propagation of Shinran’s teachings in Yoshizaki in Echizen province and later in Kawachi province. Thereafter with the aim of rebuilding Honganji Temple, Rennyo headed to Kyoto in 1478. 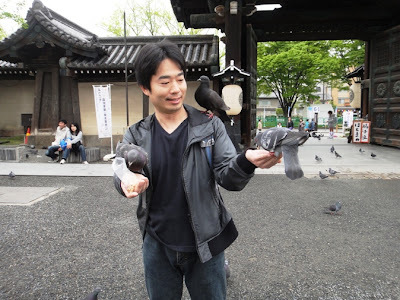 He built Honganji at Yamashina in Kyoto and a town developed around the temple. 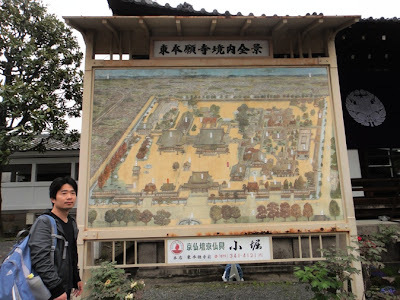 In 1532, the followers of Hokkeshu Nichiren sect feared the expansion of Honganji and burned down the temple at Yamashina. 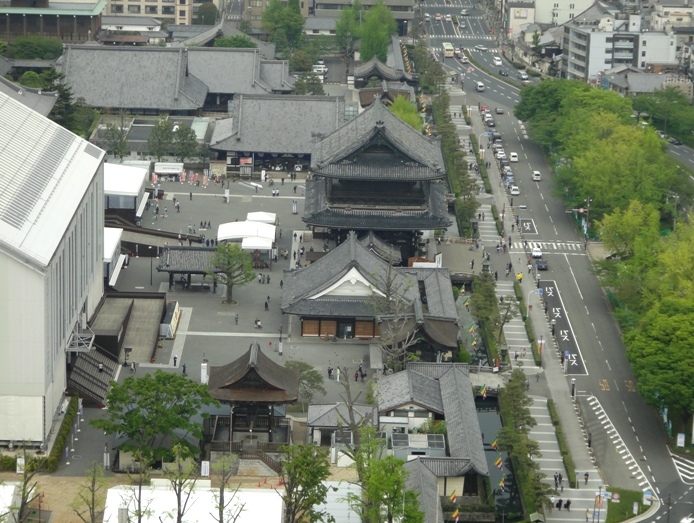 The 10th successor Shonyo fled to Ishiyama (present day Osaka) and established the main temple there. 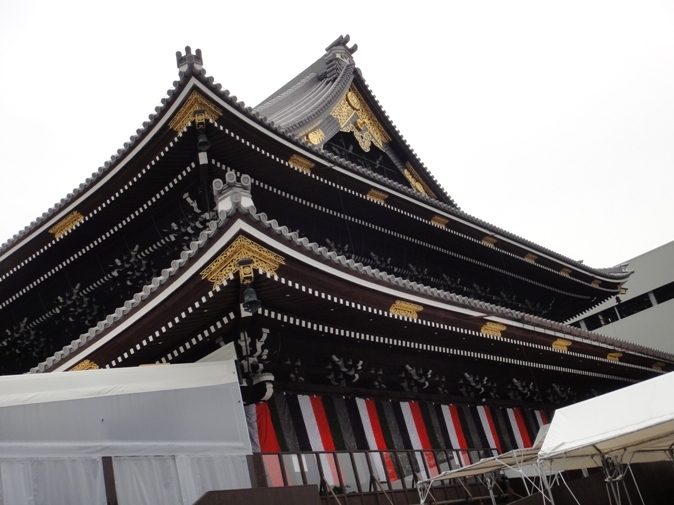 During the time of the 11th successor Kennyo, Oda Nobunaga demanded the possession of Osaka Honganji Temple because of its geographic location that was strategically ideal to bring the whole country under his rule. Honganji refused and fighting began in 1570 which is known as the Battle of Ishiyama. But finally in 1580 Osaka Honganji Temple was handed over to Nobunaga. Two years after Honganji exited from Osaka, Toyotomi Hideyoshi donated land in Tenma, Osaka and later in Horikawa Shichijo, Kyoto for rebuilding Honganji Temple. However in 1592, just after Honganji had moved to Kyoto, Kennyo passed away and was succeeded by his first son Kyonyo. A year later, a dispute concerning succession arose and Toyotomi Hideyoshi handed over the position of the successor to Kyonyo’s younger brother Junnyo. So in 1602, Kyonyo built another temple nearby in Karasuma Rokujo on land donated by Tokugawa Ieyasu. Thus, Honganji was split into two. The temple in Karasuma came to be called Higashi Honganji and the temple at Horikawa Shichijo is called Nishi Honganji. Most of the buildings in Higashi Honganji were destroyed by fire four times during Edo period and were rebuilt each time. The present buildings of Founder's hall and Amidado hall were reconstructed in 1895. 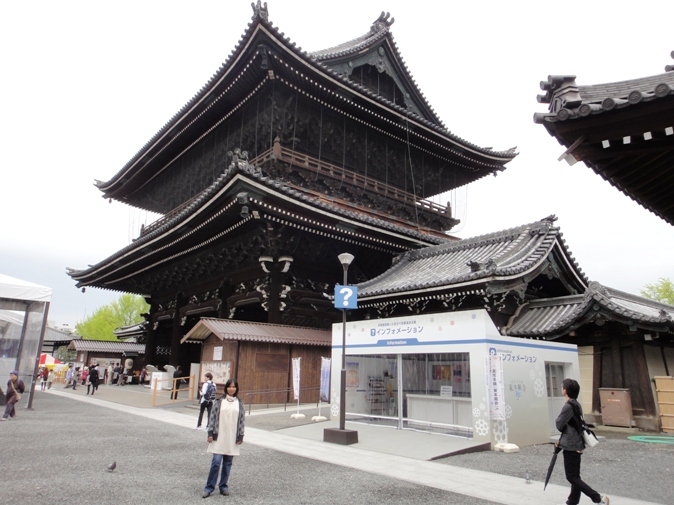 During Meiji period in 1860s, an organization called Shinshu Otani was put in control of Higashi Honganji Temple. In 1987 the temple was renamed as Shinshu Honbyo. 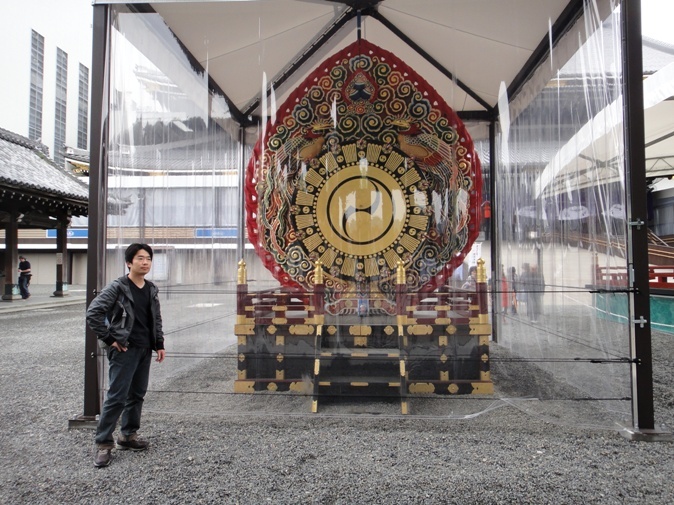 Presently the temple complex covers an area of 93140 square meters. 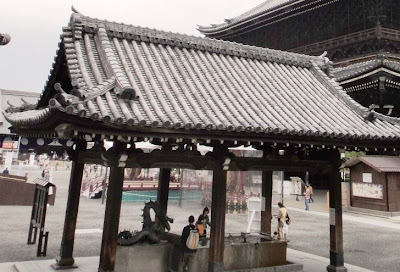 Higashi Honganji Temple is located about 0.7 km north of Kyoto railway station. From the railway station, it took us about ten minutes to walk up to the temple. The present temple complex is divided into two sections. 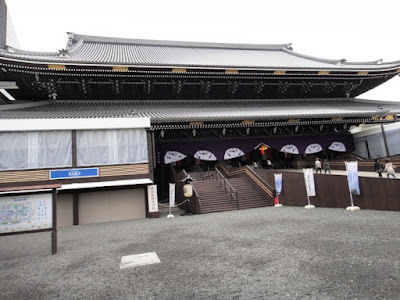 The first section includes Founder’s Hall and Amidado Hall and the second section has several pavilions and inner halls. We visited only the first section. While walking towards the temple, hubby remembered about getting a very clear view of this temple through a telescope from the observation deck of Kyoto Tower that we had visited the previous day. On reaching the temple area, we walked past a small gate named Amidadomon which is located in the southeast corner of the complex. 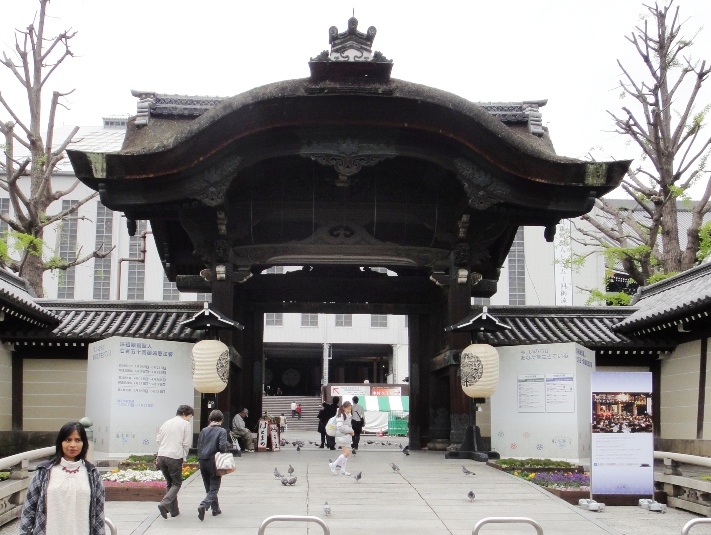 We continued walking for a few tens of steps and reached a grand main gate named Goeidomon Founder’s Hall Gate. There is a lotus shaped water fountain located outside the temple precincts right in front of Goeidomon Gate. 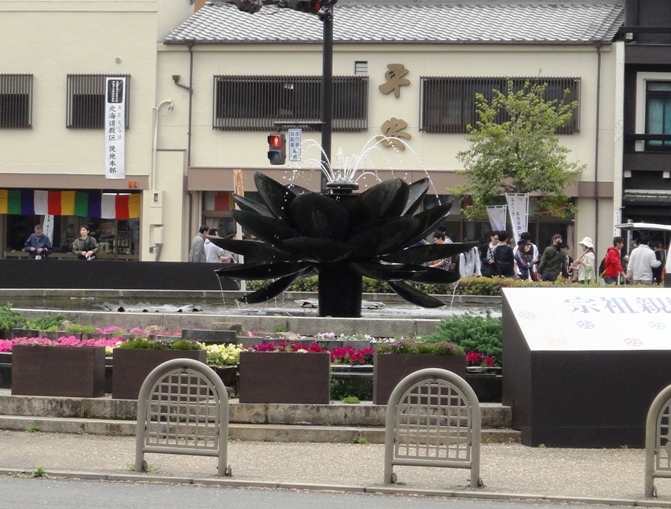 Lotus is a central symbol of Jodo Shinshu Buddhism. 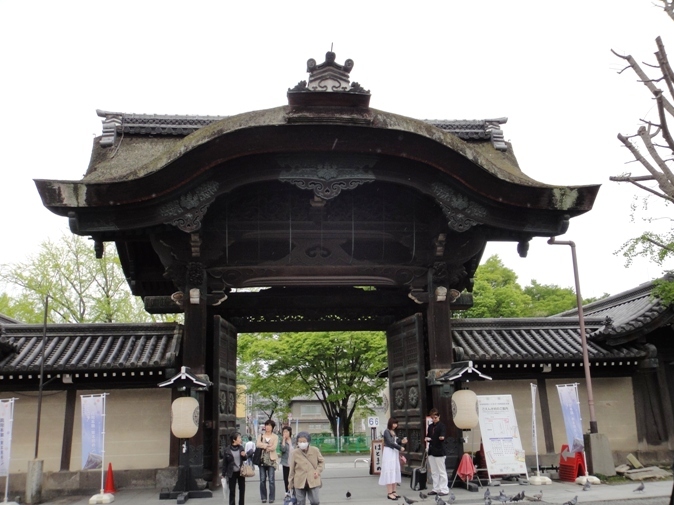 Goeidomon Gate is located on the eastern side of the temple precincts. 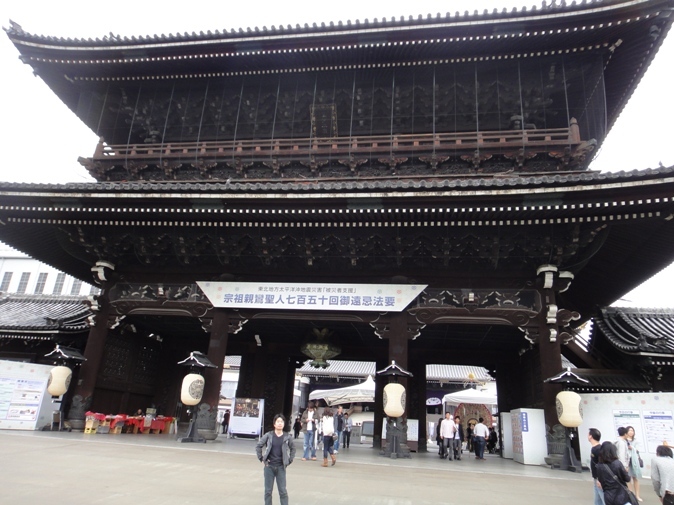 The gate is a two storied building that was reconstructed in 1911. 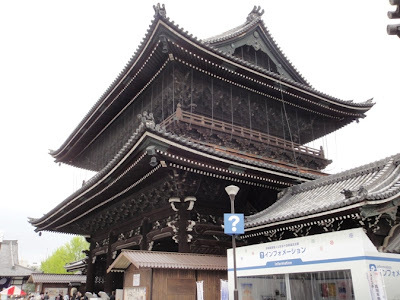 It is about 28 meters high and there is a plaque at the top of the second story on which the official name of the temple ‘Shinshu Honbyo’ is written. 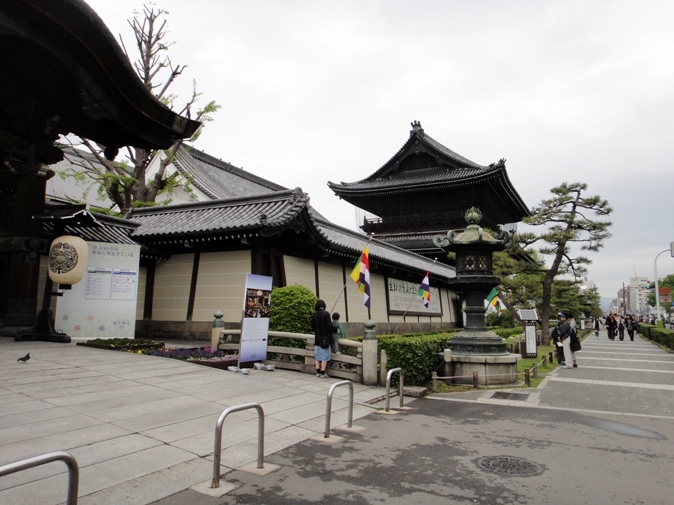 On the second floor of this building statues of Anan, Shaka Nyorai, and Miroku Bosatsu are enshrined. 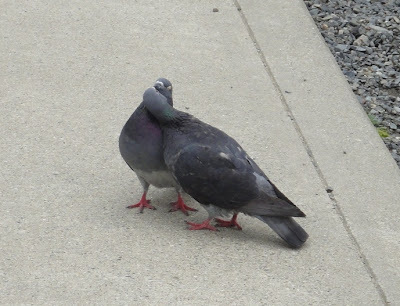 We did not visit the second floor. While entering inside the gate, we saw a beautiful lantern hanging from the roof of the gate building. 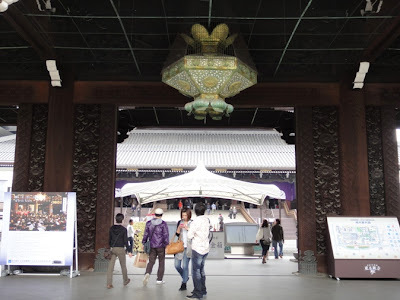 We moved around inside the temple complex, and enjoyed the architecture, shape, and structure of the magnificent gate from various positions and angles. We took several photos of the gate. 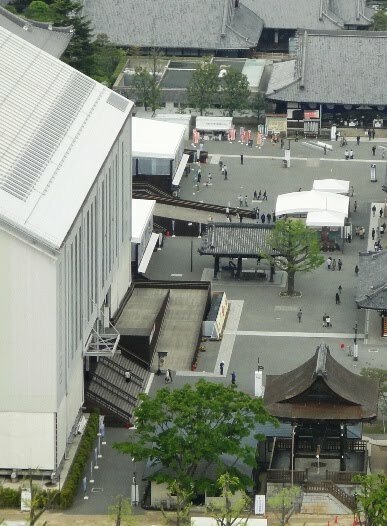 Admission to the grounds and various halls of the temple is free. We enjoyed walking inside the temple precincts. 2011 is the 750th anniversary of the death of monk Shinran, and several memorial services and commemorative events are being held this year to mark the occasion. We saw several notice boards in front of Goeidomon Gate as well as inside the temple precincts that gave information about memorial services and other special events. 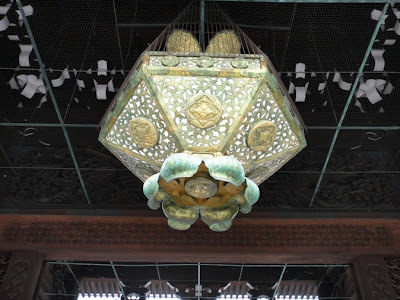 We also saw beautiful special decorations inside the temple precincts. 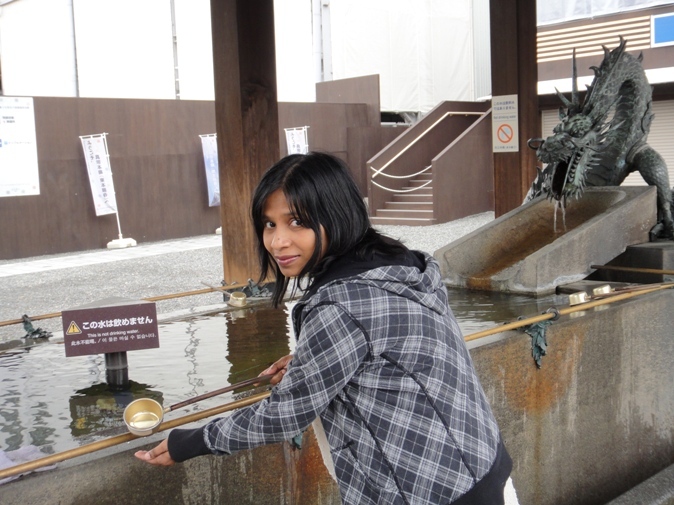 Next, I washed my hands at a water house located slightly southwest of Goeidomon Gate inside the temple precincts. Washing the hands is a symbolic act to clean the mind and body of impurity. 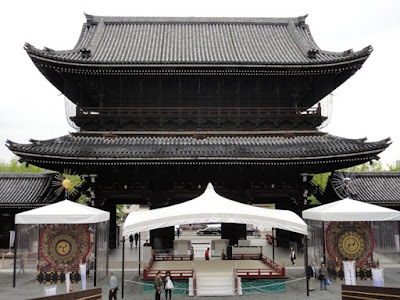 Goeido Founder’s Hall is located at the center of the temple precincts and is to the west of Goeidomon Gate. 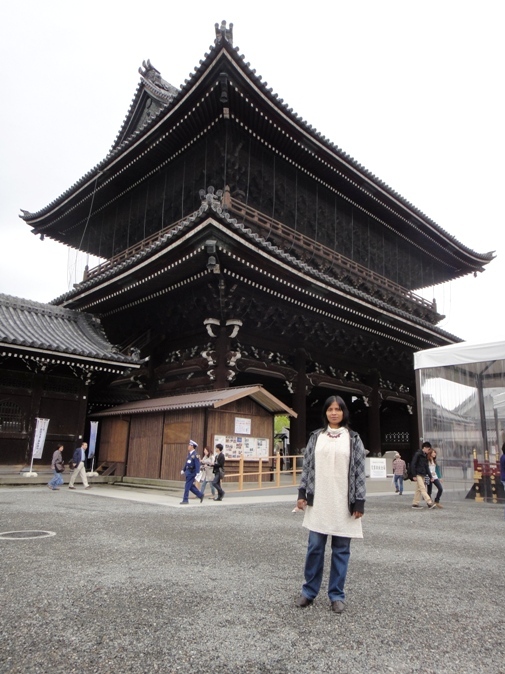 This is the most important place in the temple complex where an image of Shinran is enshrined. This hall is 76 meters long, 58 meters wide, and 38 meters high, and is one of the largest wooden structures in the world. The most recent reconstruction of the hall took 16 years and was completed in 1895. The hall has double-roofed structure. 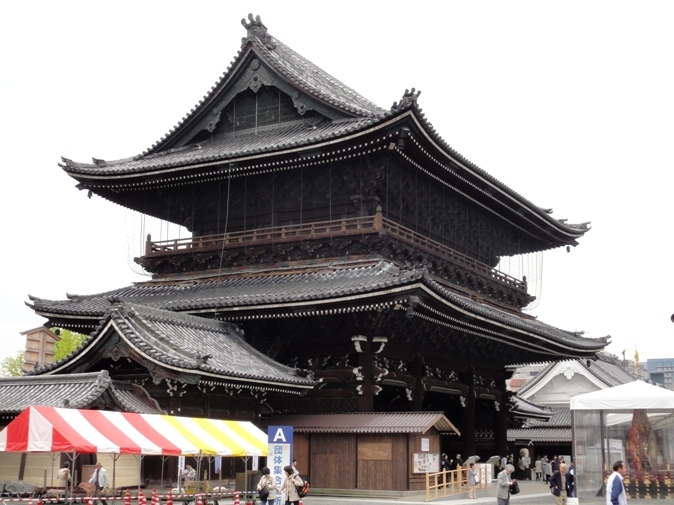 The roof has a total of about 175000 handmade roof tiles that were donated by followers from Mikawa province. 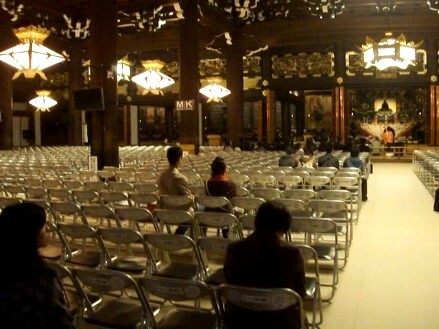 There are 90 pillars supporting the structure of this hall. 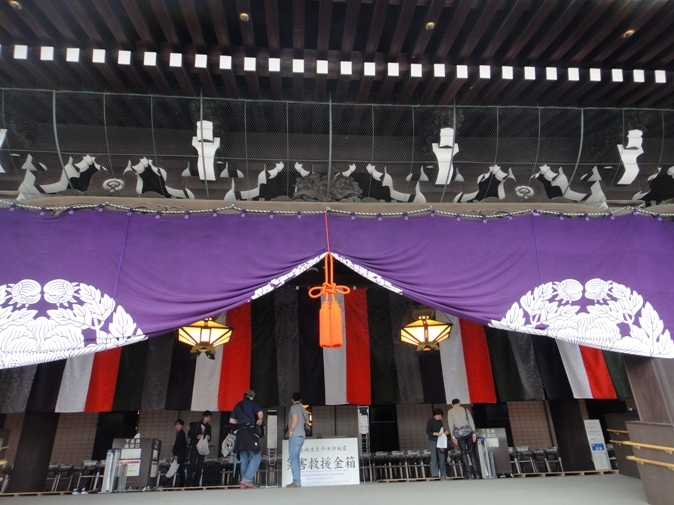 Interior of the hall contains 927 tatami mats and many sparkling lanterns. A seated statue of monk Shinran is kept on an altar. 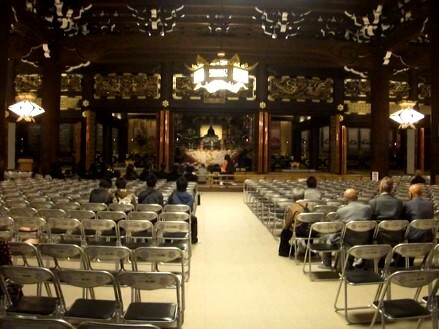 It was very serene and peaceful atmosphere inside the hall and I prayed here for some time. Goeido Founder’s Hall as viewed from the east. 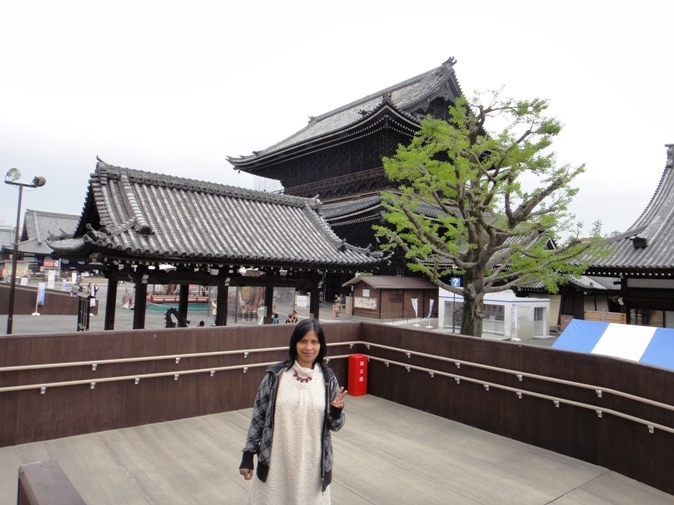 The photo is taken from Goeidomon Gate. 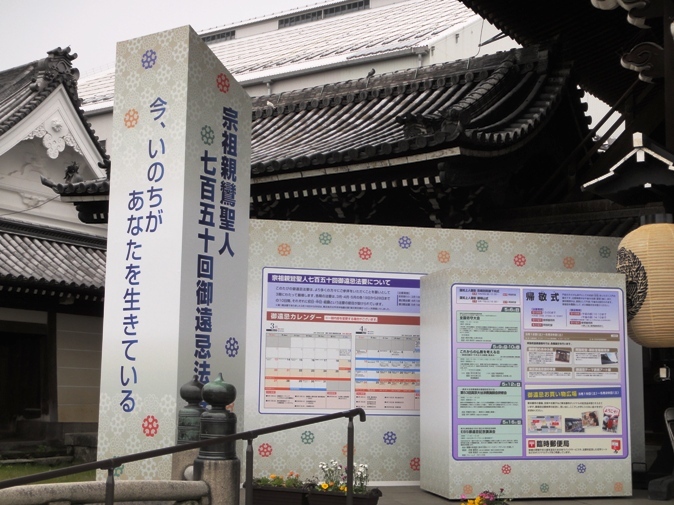 Next, we saw a reception office named Sanpai Settaisho located in the northeast corner of this section of the temple precincts. The building was constructed in 1934 and is used as a reception area for visitors and followers. After this we moved to the southern part of this section of the temple precincts, where Amidado Hall stands. This hall building is located to the south of Goeido Hall. In fact, these two hall buildings stand next to each other. Amidado Hall was reconstructed in 1895 and an image of Amida Nyorai is enshrined on the main altar. Presently, this entire hall building is encapsulated within a huge white metallic tent like structure for major renovation and repair works. So we could not enter inside this hall. 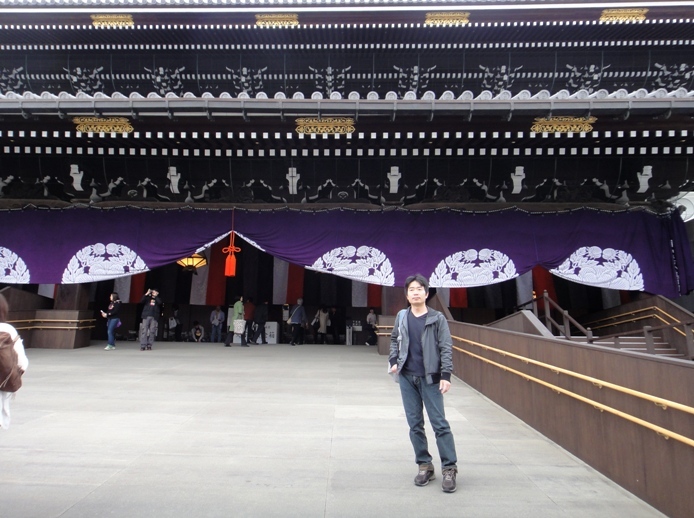 I am standing near the entrance of Amidado Hall. 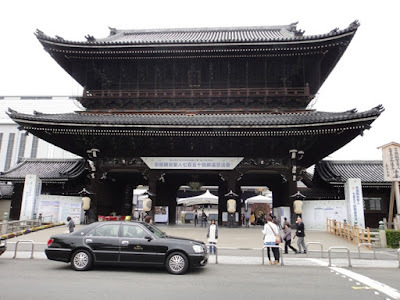 Water house and Goeidomon Gate are seen in the background. Shoro bell tower is located at the south of this section of the temple precincts. The tower was completed in 1894 and is constructed entirely out of keyaki wood. 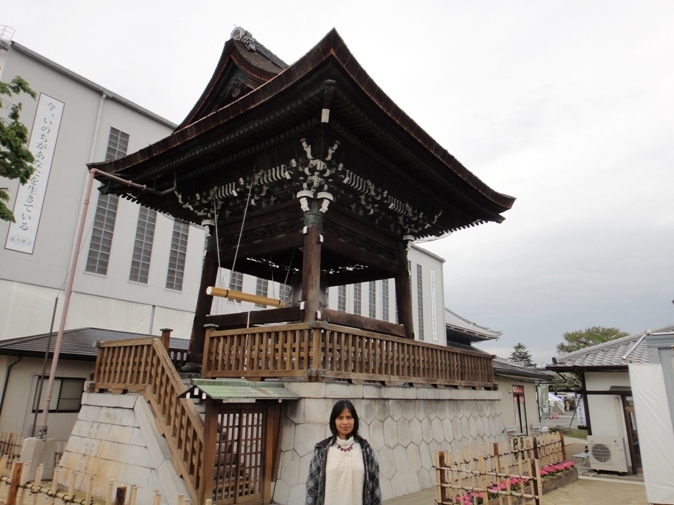 The bell which hangs there has the year 1604 inscribed on it, which indicates the time period when Higashi Honganji Temple was first constructed. 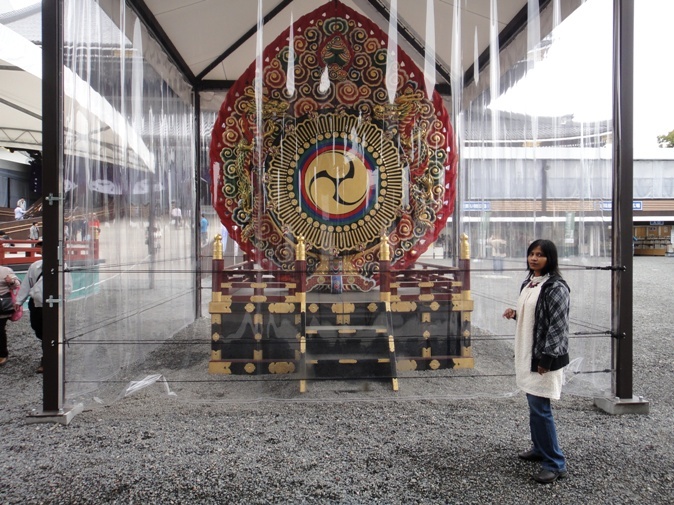 We saw a beautifully decorated gate named Amidadomon located to the east in front of Amidado Hall. 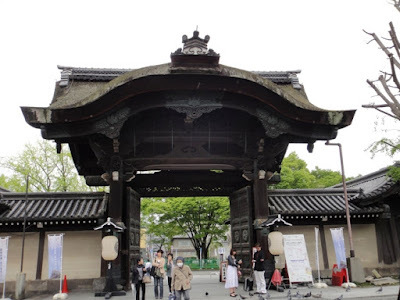 This gate was originally built not as a gate for Amidado Hall but as an entrance for the followers of Edo period to come straight off the street into the temple precincts. In fact, we had to walk past this gate to enter the temple precincts from Goeidomon Gate. 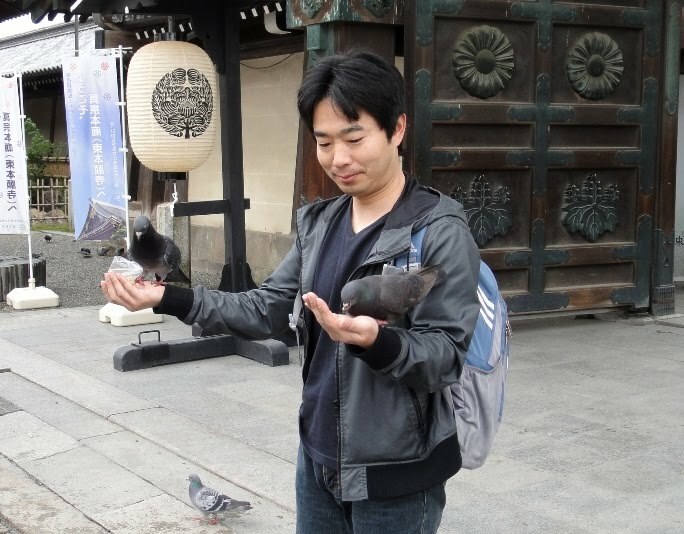 We saw many pigeons in front of Amidadomon Gate inside the temple complex. 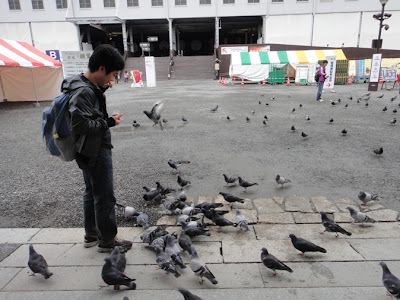 Hubby bought pigeon feed worth 100 Yen from a stall and fed them to the pigeons. He played with the pigeons for almost 20 minutes. While leaving the temple precincts from Amidadomon Gate, we noticed wonderful ornamental patterns on the gate door. We stayed inside the temple complex for about an hour. Next we visited Nishi Honganji Temple about which I will write in the next post.